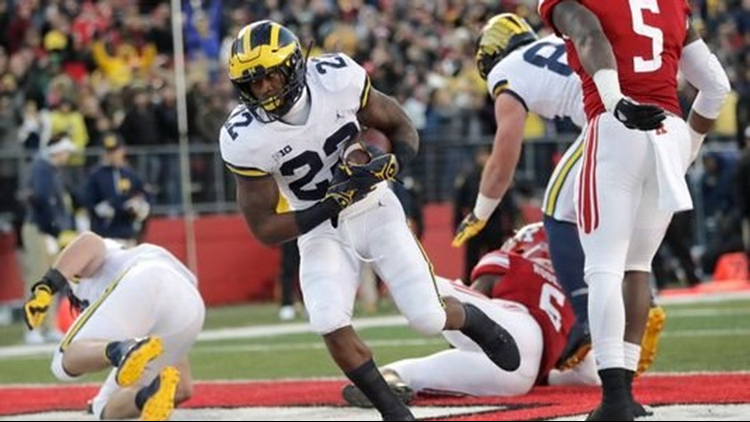 Michigan running back Karan Higdon (22) scores on a touchdown run against Rutgers during the first half on Saturday, Nov. 10, 2018, in Piscataway, N.J. Despite a significant wind for most of the day, Patterson was efficient and under control throughout in the pocket. The Wolverines (9-1, 7-0) will return to Michigan Stadium for their final home game Saturday vs. Indiana. Patterson's 16-yard touchdown pass to Oliver Martin saw the quarterback scramble out of the pocket on a broken play before throwing Martin open in the corner of the end zone. Michigan's offensive line kept Patterson clean the whole day, the Wolverines did not run him either. An easy day, no doubt. Michigan's defense did get burned on one play in the first half, an 80-yard dash from Isaih Pacheco that saw a few blown assignments both at the line of scrimmage and on the back end. His touchdown rush tied the game, 7-7 in the first quarter. Michigan scored the next 35. But other than that play, the longest Rutgers has had during its run as a Big Ten member, Michigan's defense had its way with the Knights throughout. The Wolverines were a little sleepy early, but eventually settled in and kept Rutgers off the board the rest of the way. After Patterson threw his third touchdown in the third quarter, Michigan went to third-year sophomore Brandon Peters for the first series of the fourth quarter. It lasted one snap, as Chris Evans took a handoff 61 yards for a touchdown. Michigan true freshman Joe Milton took the next series. Milton has now appeared in two games this season and can keep his redshirt if he plays in only two more. But not more. Michigan senior running back Karan Higdon was mostly used only in the first half, but he did break the 1,000-yard mark. Higdon is the first Michigan running back to rush for 1,000 yards in a season since Fitzgerald Toussaint in 2011. He's the second since Mike Hart in 2007. Contact Nick Baumgardner:nbaumgardn@freepress.com. Follow him on Twitter @nickbaumgardner.